What a weekend of fun, fly fishing, and many new friends. We kicked off our 9th annual Rendezvous on Friday night with a bunch of fun casting seminars, including a women's Cast 'n Blast combination lesson. Brian Okeefe gave us a FABULOUS casting clinic and slide show inside the lodge. He mentored us on how to take better photos with basic gear! Friday was great kick off with lots of smiling ladies coming off the Sporting Clays course. Shooting and fly casting is a great way to have some fun out here. We did 3 different Advanced Casting classes. Kynslee Scott let the women's "Advance Your Cast" seminar and did a terrific job honing the ladies skills throughout the weekend. All the women seemed to have a great time! There was so much fun stuff going on throughout the day and LOTS of folks entered the Non Pro 5 Weight Casting Competition! Even a few kids got in on the action and gave it a shot. The course was hosted by Sage Fly Rods and they generously donated a Sage X 5 Weight Rod with a Sage Spectrum LT Fly Reel to the winner! Jim Dupape a local angler that had practiced for the even took home the crown! He had competed here before so it was wonderful to see him take home such a fine rod. This is one of the funnest events to watch! Loud "walk out music", hilarious MC's, admonishing humor, and some incredible casting make this event damn entertaining. We got to see some of the world's best casters compete outdoors, standing in a Clackacraft Drift Boat, competing for the ultimate prize..... PRIDE! Last year I (Joe Rotter) barely edged out Zack Dalton (Sage Fly Rods/RIO Products) for the win. I honestly didn't think he was beatable. I missed my last shot attempting to put my entire loop AND fly through the hoop clean. I punched the loop through... but the fly hung up and cost me the match. This year.... we flip flopped with Zack barely edging out myself and Brian Okeefe. Brian and I tied for 2nd place and Zack took the crown. He is a one helluva caster. Actually a bunch of these guys are. We have a few guys on staff that are in that top tier. George Cook is absolutely outstanding as is Peter Knox who designs rods at Sage. Zack Dalton about to "send it" with the 10 weight rod and 3 weight line! After the dust settled on the course we had a duel... it was Team Sage/Bainbridge versus Rotter and Okeefe aka the First Place Loosers. George Cook and Zack Dalton teamed up to represent Sage and proposed a duel mismatching a 10 weight line... on a 3 weight rod... and a 3 weight line... on a 10 weight rod. Believe me, to cast these setups 80' you better understand how to fly cast damn well because there are some tricks to it. We cast for pure "Huck Factor 11" throwing 2 shots as far as you could which leaves no time to figure things out. Brian threw the longest cast with the #3 rod/10 weight line and I managed to somehow make the longest cast with the #10 rod/3 weight line. It was a ton of fun, super great to watch and engage with. Folks looking on got a good show on some outstanding casters. To rub elbows with these guys and have some fun celebrating fly casting was really cool. 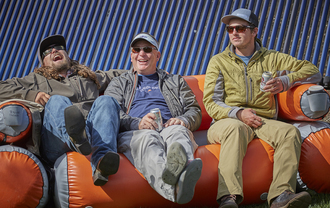 Our guides seems to enjoy heckling from the Aire Couch at the Simms booth! Red's and Backcountry Hunters and Anglers put together a fundraiser/membership drive using some really cool 3-D archery shots over the river! This group fights for your public land so join today! This was the awards ceremony after the arrows quite flying. Young Jensen Rotter competing in the casting competition. He'll be in the finals next year! This event was AWESOME! It was unique, fast paced, and a great time! 6 tyers competed with "mystery materials" given to them a minute before their assigned fly pattern. We had 10 minutes max to complete the pattern and utilize the material! It was a great time and James St. Clair and Brett Wedeking were awesome to watch. These guys can wrap some bugs! The highlight of this event, in addition to raising money for Youth Outdoors Unlimited, was listening to Steve Joyce MC this portion and heckle the tyers to no end. I was laughing so hard I could barely tie a few times! Beer for the big boys... Sprite for the kids. Everyone was happy! Ever wonder what it feels like to finally win a damn raffle! Yeaaa!!! Sage Rod! Winner! This is a family friendly event with entertainment for everyone! They are never too little to get started. On Sunday Curtis gave some great Wingshooting and safety lessons to the kids that signed up for the Kid's Shooting Lessons. Keep in mind we did all this for free! The entire staff worked so hard. Steve Joyce and Ricky Davidson put on a great spey fishing seminar. 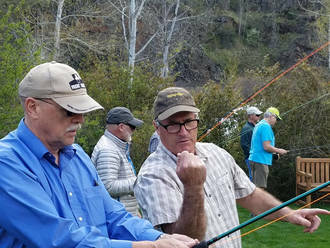 Steve teaching, Ricky casting. Perfect duo. THANK YOU FROM THE RED'S STAFF FOR ALL THAT ATTENDED!